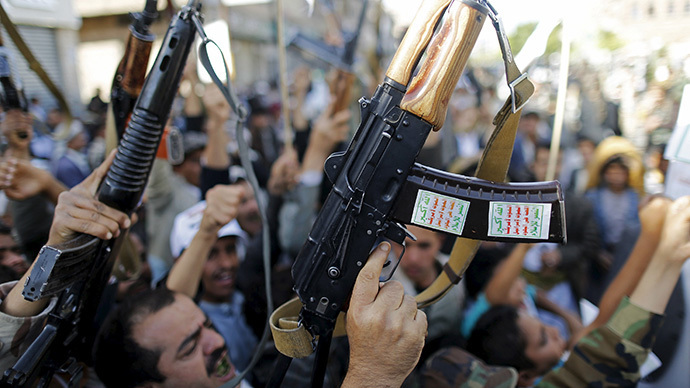 JNN 24 Apr 2015 Sanaa : Yemen’s Shiite Houthi rebels have threatened to launch an attack on Saudi Arabia if the bombings in Yemen do not stop. The Zaidi group has sent the warning to Riyadh and demanded that UN-brokered political dialogue be resumed in Yemen. The Houthis “will carry out a military attack on Saudi Arabia, if the airstrikes on Yemen don’t come to an end,” Mohammed Bahiti, member of the Ansar Allah movement, told TV channel Al Mayadeen. Bahiti stressed that the Houthi rebels “do not require missiles” to carry forward with their promise, referring to Yemeni military depots destroyed in the airstrikes. He also rejected claims that Operation Decisive Storm, led by Saudi Arabia, was able to successfully destroy the Houthi rebels’ military capabilities. According to Bahiti, Houthis are ready to resume UN-sponsored talks from “the point they were at before Saudi aggression.” The previous round of talks ended in January. “The Yemeni people will not honor Mansur Hadi and allow him to return to power,” Bahiti said. The statement came against a backdrop of intensified anti-Houthi coalition bombing, with reports on Twitter suggesting more rebel-controlled military installations have been targeted and destroyed. On Tuesday, the Saudi-led military coalition announced that it has completed Operation Decisive Storm against the Houthi rebels, adding that the campaign is now switching into a new phase codenamed ‘Restoring Hope’, which will focus on anti-terrorism, security and finding a political solution to the crisis. However, less than 24 hours later, airstrikes resumed. Fighting continued into Thursday, as the Shiite rebels pushed on with their offensive in the south and the Saudi Arabia-led coalition proceeded to intensify airstrikes, hitting several cities, including Aden, Houdida, Taiz, Dhale and Ibb, according to AP. Saudi Arabia and its allies have been engaged in a campaign of airstrikes and a naval blockade of Yemen, targeting the Shiite rebels. This was in response to the Houthis seizing control of the capital Sanaa, advancing on the major port city of Aden, and forcing Hadi to flee to Saudi Arabia. Since the campaign began on March 26, there have been over 4,000 airstrikes that killed nearly 1,100 people and displaced 150,000 others, according to UN resident coordinator in Yemen Paolo Lembo. This entry was posted in Middle East and tagged Air Strikes, Saudi Arabia, Shia Houthis, Yemen. Bookmark the permalink. WHY GIVE A MERE THREAT OR IS IT A WARNING ? BEFORE FINALLY PUNISHING THE JEWISH WAHABIBI TAKFIRIS .FINISH THEM TO THE LAST CRIMINAL . NO USE MERE THRFEAT , DO IT , LEAVE ONLY MAKKAH MADEENAH, TARGET THE PALACES OF JEWS TURNED PSUDO ARAB ROYALITY . .